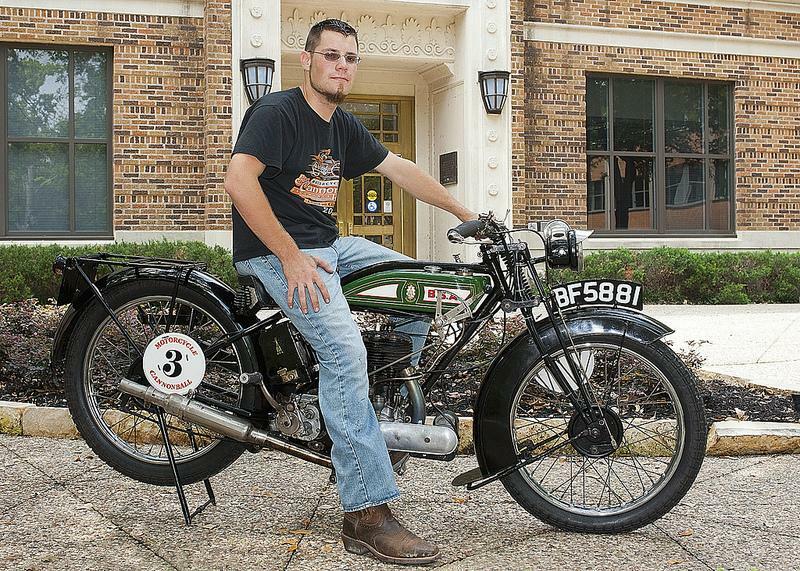 20 year old Buck Carson of Livingston will be the youngest rider to have ever entered the coast to coast classic motorcycle race. My name is Buck Carson and I'm with Carson Classic Motors, of Livingston, Texas. Shawn McGarry SR showed you a bit of information about our vintage motorcycle shop and upcoming race. Here's some more info about us, and what this event is all about. Over the last twelve years, my father and I have become heavily involved with vintage motorcycling-specifically the restoration and preservation of historic antique motorcycles. We have amassed a collection of more than 70, mostly British, classic motorcycles spanning over 100 years, all of which are in running order. We recently began an endeavor into vintage road-racing in October 2011, where I raced a British-built, single cylinder 1911 Triumph Roadster at the world-renowned Barber Vintage Motorsports Park in Birmingham, Alabama during the 7th Annual Barber Vintage Festival. Our racing team consists of my father, Mike Carson, and myself, as well as a close friend by the name of Shawn McGarry, and a family friend from England, Steve Norton. from our 28 foot mobile workshop- a group of four from England who have entered 1924 and 1926 Rudge Four Valves, and a group of three from Australia who have entered a 1925 Invincible JAP. These international teams will be utilizing the equipment inside to make necessary repairs along the route. We have already welcomed multiple sponsors on board, including the Confederate Chapter of the Antique Motorcycle Club of America, Copart Inc, Gibson Commercial Construction, the Indiana Chapter of Associated Builders and Contractors, TBT Industries, Bluegrass Construction, Vintage and Veteran LLP, and several others. The Cannonball presents an unprecedented opportunity for international marketing and advertising, as numerous global media outlets will be along for the race. I have included links below to the official motorcycle Cannonball website, my personal Cannonball Rider's blog, as well as the team's YouTube Channel, and Facebook Page. Additionally, I have attached a copy of our sponsorship flyer, some pictures of the 1927 BSA S27 (can send more if needed) and team racing trailer, and a sample of the trailer exterior graphics. My contact information is also listed below. If you would like to comment on this story, we'd love to hear from you. Please be sure to specify which story you're talkng about. Your comment will be posted in the Letters to the Editor.